You may not feel bad about coming home from vacation with a few extra pounds – if those pounds mean the weight from fabulous souvenirs you found in faraway places. But if those pounds are the type that make you regret all that eating and drinking, or the kind that make your slacks impossible to button, those are pounds of a different sort. You may already be fighting some extra pounds that come with midlife, but you don’t want to be fighting another battle – the pounds that come from vacation. 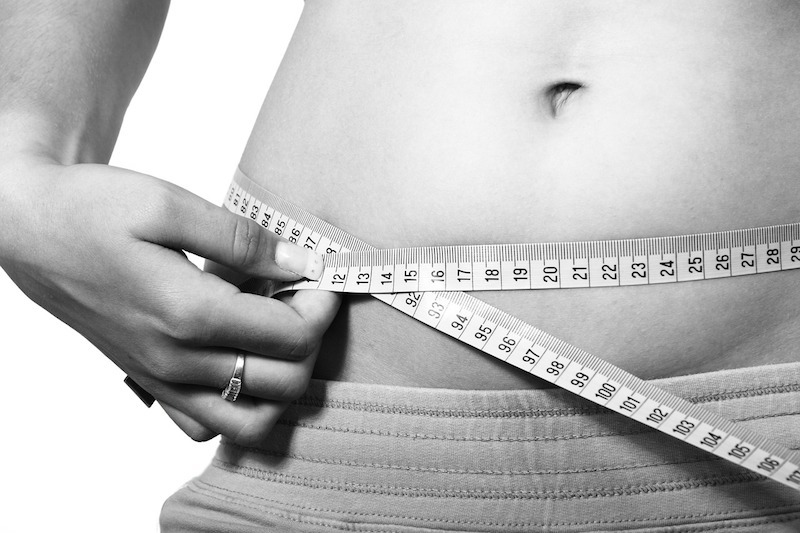 It’s a common phenomenon among travelers: As your vacation progresses, so does your waistline. You come home, gather up your nerve to step on the scale, then bite your lip and shake your head, wondering if it was all worth that weight gain and vowing not to do it again. Vacations offer us that much-needed and much-deserved break from all the pressures of everyday life; but unfortunately with that, we often get away from our sensible health habits. (Hey, I’m on vacation! Sound familiar?) Way too often that free spirit lets loose on one too many fancy cocktails or gooey desserts. 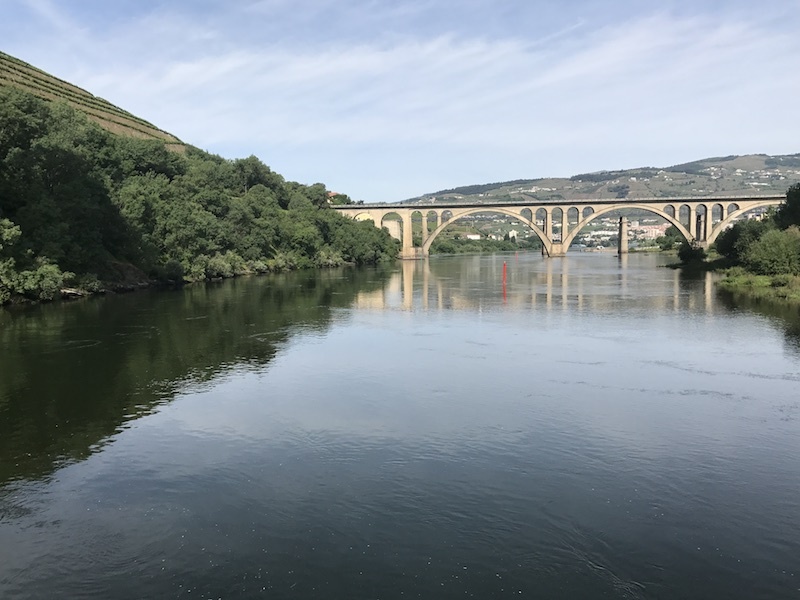 On a recent Viking River Cruise through the gorgeous and scenic Douro Valley of Portugal, I was faced with the challenge of keeping myself healthy, or at least as close to healthy as I could. It’s pretty easy to eat healthy and exercise regularly when I’m home, but being away on vacation can mess up all good intentions. And as midlife descends, it usually takes more effort and dedication to stay on top of our health. But rather than see vacation time as a dilemma, you can view it as an opportunity. Vacation can be the perfect time to fine-tune your health habits. You’re relaxed, sleeping well, and usually on the move, exploring new territory. You can keep your wits about you, and even come home with no regrets – with a little knowledge and advance planning. 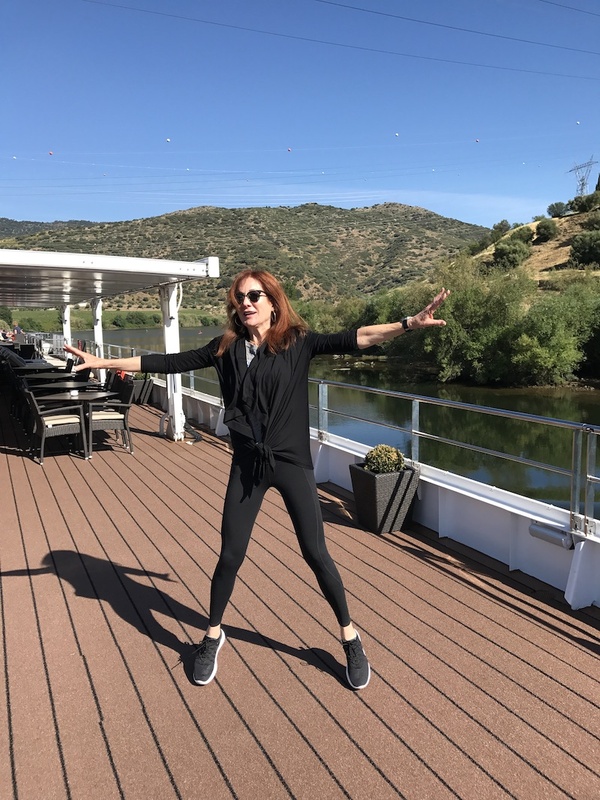 You can stay fit on a river cruise! Since you need to get to the airport up to three hours before most flights, you’ll be spending a lot of time there. And since you’ll be sitting on a plane for untold hours, why sit more? Take the opportunity to sneak in some exercise. Walk up and down the long corridors, find a set of stairs to climb, or even take a power walk or jog (don’t worry about getting funny looks; people will just assume you’re late for your flight!). Seize any opportunity to move – you’ll have limited opportunity once on the plane. Additionally, the menu changes each day and other options are always available, like poached salmon, Caesar salad and grilled chicken breast. You can make healthy choices – they are there – and also make your meal healthier by asking for light dressing (or dressing on the side), forgoing the bread and butter offered at every meal and asking for vegetables to be steamed and not sautéed. It also helps to drink a glass of water before you start eating – this helps quell hunger and fill an empty stomach. The same rules apply to the buffet at breakfast, piled high with scrambled eggs, bacon, sausage and potatoes. Rather than taking it all, choose one thing you can’t be without, and eat it sparingly – often the first few bites are the most satisfying, anyhow. (And don’t ignore the fact that there is always fresh fruit on the buffet.) Then, order off the menu – which is an option – where you can get healthier choices like poached eggs, oatmeal or yogurt parfait. Make sure to always include some protein, which will keep you fuller for longer. 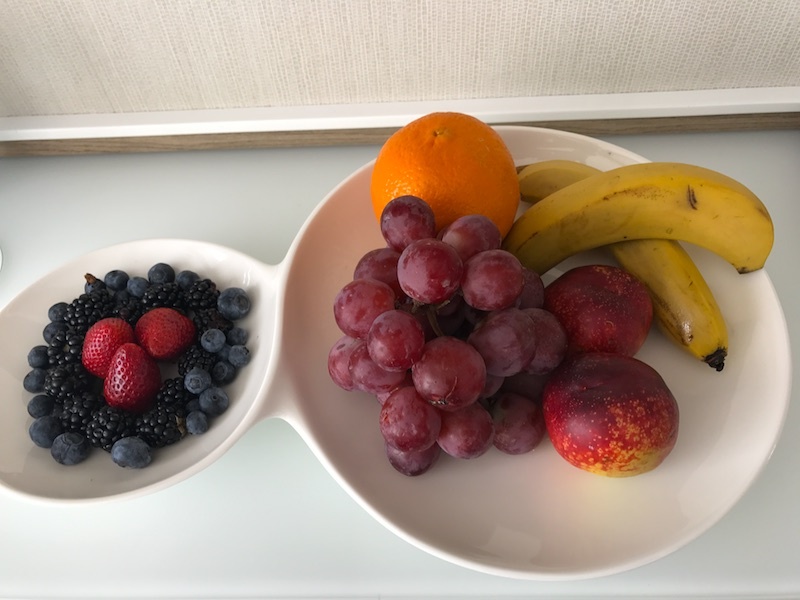 Every morning, each stateroom receives a beautiful and bountiful tray of assorted fresh fruit. And there’s a free-standing coffee station on the boat, stocked with sweet treats for snacking. 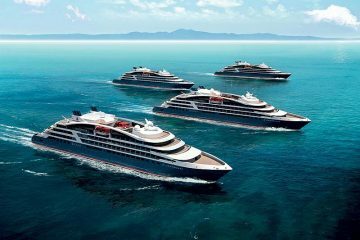 However, if you’d rather stay away from the cookies, but don’t want to get hit with hunger pangs in between meals or when you’re traveling to and from the wonderful off-shore excursions, grab a piece of fruit instead. Or, when you pack your suitcase for your trip, throw in some healthy snacks to bring along. That could include protein bars, small zip-top bags filled with nuts and dried fruits. My motto is “never go hungry.” If you do, you’ll make unhealthy choices at vending machines or restaurants when you go ashore. 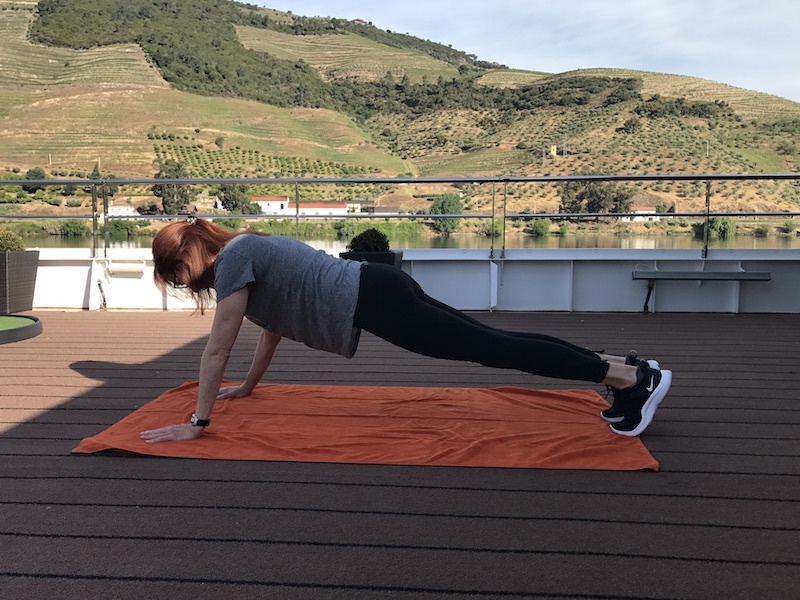 It’s all too easy to skip a workout when there’s no gym onboard, and space doesn’t usually allow for a gym on riverboats. But now more than ever, it’s easy to take your workout with you wherever you go (sorry, no excuses!). A jump rope and a resistance band take up little to no space in your luggage; you can take them out on the upper deck (where there’s an astro turf surface to make walking easy) and have a good and energetic workout. There are other things you can do as well. For instance, you can easily use your own body weight as resistance to give you a fabulous total-body workout by doing push-ups or dips against the rails of the boat (or on the floor), squats, lunges, leg lifts and even crunches and planks for your abs. 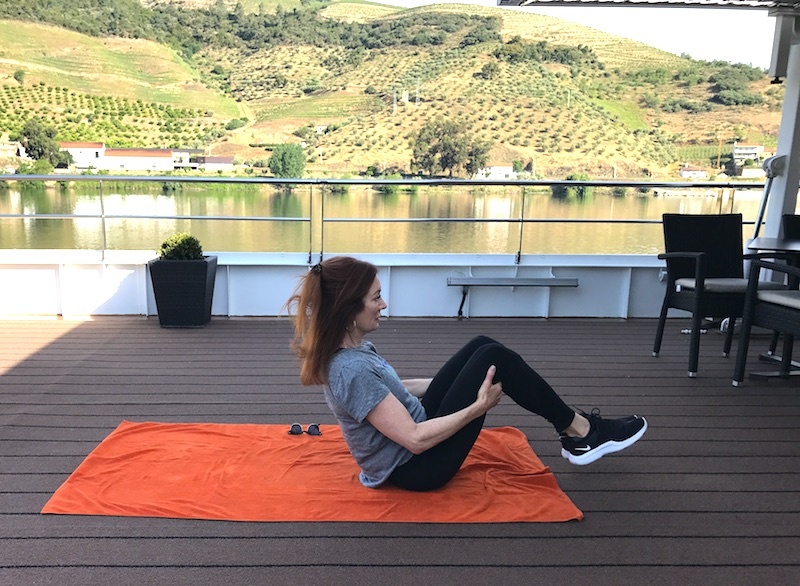 One morning, I laid a large towel down on the deck and indulged in a 30-minute workout outside in the crisp morning air, inspired by the breathtaking and lush scenery along the sides of the majestic Douro River. 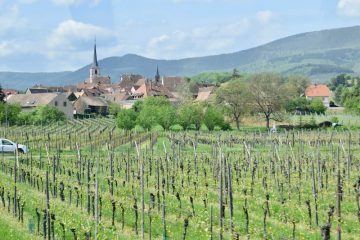 Don’t forget too that there are always opportunities to walk laps on the top deck of the boat, or on the many off-river excursions through ancient (and sometimes hilly) villages you’ll visit throughout your trip. Rather than shy away from the sometimes-tougher walks, look at them as opportunities to stay in shape. Many of us drink more than we normally do when we’re on vacation. (I’m not making any judgments here!) 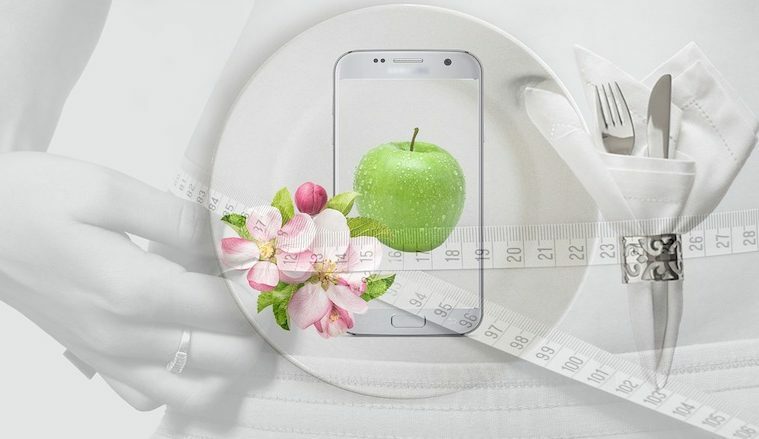 But those “liquid calories” can add up fast – especially when you’re imbibing a fancy specialty drink, which often contains mixers like fruit juice, cream or another sugar or fat-laden ingredient. You might know the drill: You have a glass of wine (or two) at the bar before dinner, wine with dinner (Viking offers unlimited house wines at dinner) and an after-dinner drink (or two). An article on livescience.com cites a 2012 study that found the average American adult consumes 100 calories a day from beer, wine or other alcoholic beverages, and close to 20% of men and six% of women consume more than 300 calories a day from alcohol. Some quick facts: A 12-ounce glass of beer has about 150 calories; a 1.5 ounce shot of gin, whiskey, tequila or vodka has about 100 calories; there are about 125 calories in a 5-ounce glass of red wine. 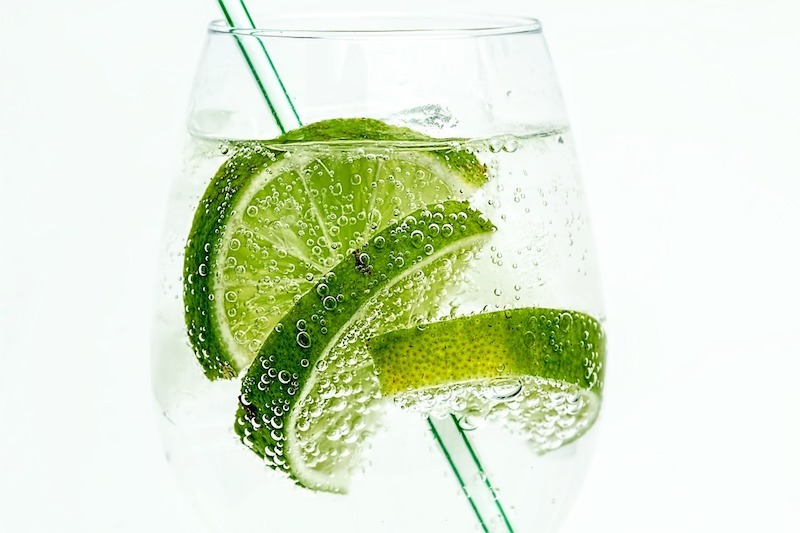 And watch out for tonic water – it’s not the same as sparkling water and contains a lot of calories and sugar. Since drinking loosens inhibitions, the more you drink, the more likely it can be that you’ll order another… as well as snack on “bar food” which is often unhealthy. Before you even begin (and get too loosey-goosey), remind yourself to pay attention; you may even want to set a specific limit on the number of drinks you have in advance (and it doesn’t hurt to tell your traveling companion to make sure you follow your own orders). Another helpful tip is to alternate your drinks with a full glass of water (this will not only give you something else to sip on, but will keep you from dehydration and a possible hangover the next day). Or, order drinks that have less calories, like a wine spritzer (which cuts the calories and quantity of wine with seltzer or club soda), lite beer or a low-calorie version of a Cosmopolitan (raspberry-infused vodka with club soda and a splash of lime and cranberry juice). 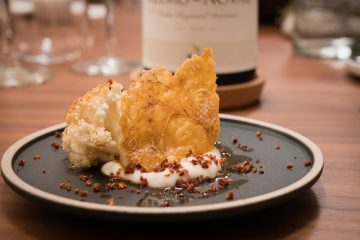 Even though you want to stay fit on a river cruise, don’t feel that you have to totally deprive yourself of tempting treats; after all, you’ll want to experience new and unknown culinary surprises. To fully enjoy, just be mindful of your portions. Be realistic about your fitness level. Now is not the time to begin a new fitness program. 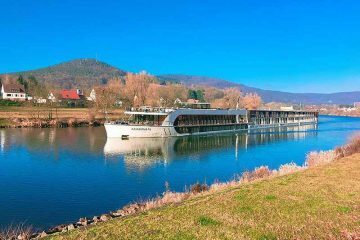 But if you’re already in shape, a river cruise can offer many hidden opportunities to stay that way. 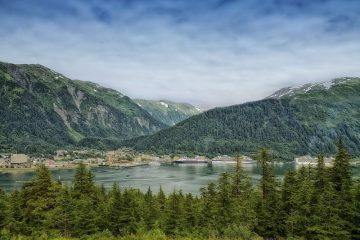 Make sure to bring along comfortable walking shoes or sneakers; these will also serve you well for walking on the deck of the boat. 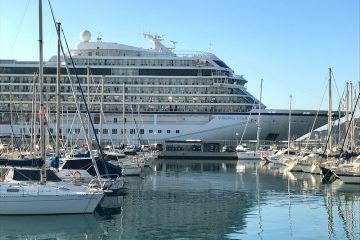 The author was a guest on one of Viking River Cruises’ Portugal’s River of Gold cruises. Next ArticleYou’ll Love These Things to do in Mendocino County! Sheryl Kraft is a freelance journalist and blogger who specializes in health, nutrition, wellness, fitness and spa travel for major publications and websites. Her work has appeared in AARP, Prevention, Chicago Tribune, Family Circle, Women’s Day, Weight Watchers, WebMD, Everyday Health, HealthyWomen and many more. Sheryl has visited, luxuriated, danced, hiked, relished and written about world class spas such as Golden Door, Miraval, Canyon Ranch, Red Mountain, Pritikin and The Boulders, and always returns home missing her time away and looking forward to her next spa experience. Visit her on her blogs -- "My So Called Midlife" and "Midlife Matters." Great tips! I am still working off the extra pounds that snuck around my middle during my recent Viking Ocean cruise. Would have been far easier to have kept them off in the first place. So many great tips, Sheryl! And you can tell from your svelte river-boat photos that you were following your own advice. I wear sneakers a lot on trips but rarely add on the jumping jacks part. For the sake of my belly, I’ll try!